I'm sad now. This book is making everything sadder. Fetus!Ben could feel his presence too, the closer Rax got to fulfilling his destiny. WTF happened to Rae Sloane and Bredol Hux in the UR? BC we have definitely not seen them in the ST. I'm wagering the remnants of the Empire reached their destination and Snoke was waiting to take over their creepy child army for them. Yikes. @Helix wrote: I'm sad now. This book is making everything sadder. And believe it or not, there was very little Ben/Leia/Han relative to the rest of the book ... but those few paragraphs told a lot. However, because they are so few, I have got to think that there has to be much bigger stuff coming up in the movie ... because in other respects, like the Force and such, I thought a lot of information seemed to be dropped. Deep SW scholars like @panki, @Darth Dingbat, @Irina de France and @applecrumble122 and anyone else I am forgetting, please let us know when you finish the book, because I have a lot of KOTOR-ish kind of questions and I think some stuff was hinted at in the book. I agree that Snoke is the ancient evil. On in-utero Ben, you may be right about that as Rax became more successful, Ben became more threatened. Also notice that that "serpent" plant was in the room with him. Further with things "serpent", Niima is continually described as being very different from a regular Hutt. She is described as more of a "serpent" (again a demonic type of world). She also has tortured people who become her blind slaves just like Snoke has. There is something different about her. People 30 years later worship her ... She also speaks in ancient Huttese. Is she some old ally of the devil (Snoke)? Also, with the planet emanating the orange and blue light, Wendig describes it as a pulsing, living thing ... He uses very similar language to describe in-utero Ben as a pulsing "light". Is that just because they are both part of the force, or is it because they are both special? 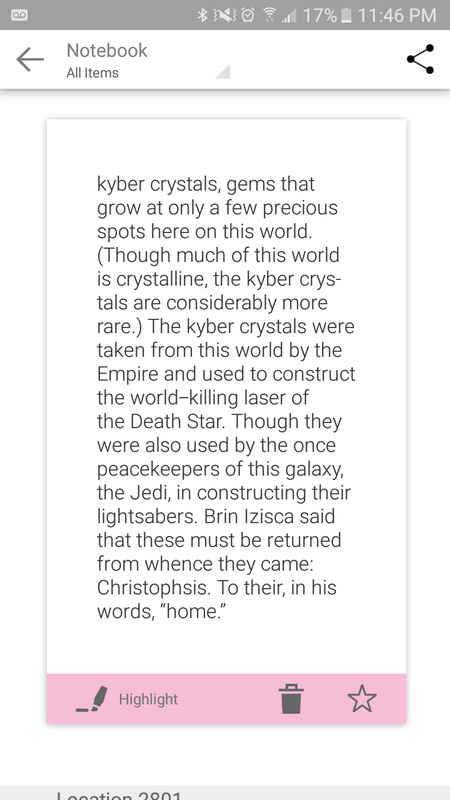 Maybe like Chirrut says, strongest planets have hearts of kyber and Ben is described as very strong in Life Debt. Just speculating. There is so much more ... I have to look at it again because I binge read it too. On Rae and Brendol, I have a feeling that Brendol gets taken out pretty fast. Rae describes him as pretty broken down man and I am sure child groomer Snoke is more than happy to be Armitage's new dad. He actually probably saves Armitage from some abuse to get his loyalty forever. As for Rae Sloane, I can't see Snoke liking her in the long, nor her liking him ... but could she be Finn's mother? 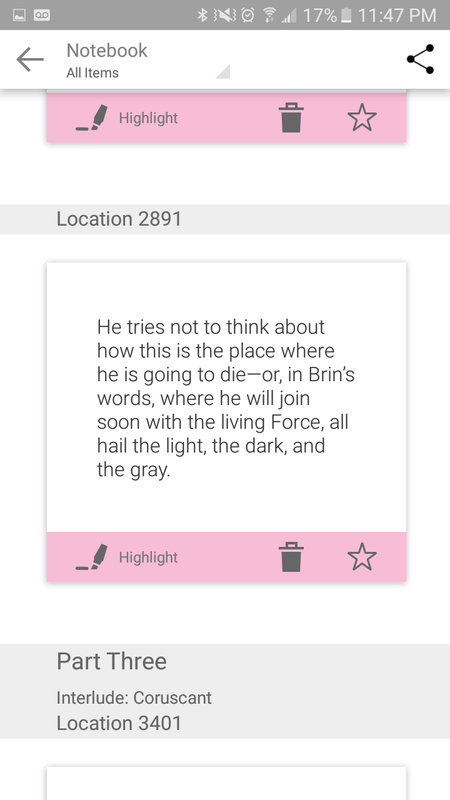 @SoloSideCousin I'm grateful for the highlight function in the Kindle app - I have so much to go back and look at tomorrow. I noticed many parallels with TFA and RO and some tragic foreshadowing. Finn's mom = Rae Sloan is a distinct possibility. I'm trying to puzzle out the connection between Rae Sloan and Rey of Jakku though. There's also a passage about Rae garbed as a scavenger. Obviously Rae is a woman of color and cannot be Rey's mother, but what is the connection??? It appears the back story is becoming more clear. Her role and destiny is to counter Snoke, perhaps? And no, I've not read any of the books, only on summary. Oh brilliant catches @ meadowofashes! I caught the "gray" part of that section, but I completely missed the "returning home" part!!!!! Another excellent thought with Rae Sloane as scavenger! I just assumed she was just becoming part of the Jakku scenery, but in a way she was a searcher too ... searching for what all this Rax stuff was about. Rae Sloane is a very tough cookie, but she did not seem impressed with the feral kids, nor with how Armitage became more vicious as time went on. She also really disapproved of the thuggish and "tribal" type of behavior of the stormtroopers on Jakku. She is realpolitik/"old school military discipline" like Bismarck. (Oh did you notice how some of those stormtroopers had markings on their armor ... including one with grey finger marks ... makes me think of what triggered Finn). In fact, with some of the "Boys from Brazil"/"coming out of Argentina hiding" that JJ and LK seemed to engender into the FO, Rae Sloane might actually serve as an analogy to von Stauffenberg and the other regular German army officers (as opposed to the SS) who plotted to kill Hitler and take back their country. I doubt any of those guys envisioned turning Germany into some Teutonic version of Woodstock, but rather, I imagine that they wanted to return to something more orderly, something maybe even a little monarchical and old Prussian army traditional. I think Rae Sloane could maybe be described as that kind of type ... but instead she is going to find a Palpatine-ish and Rax-ish disgusting and heinous and feral and thuggish depravity times 1000 when she gets to the Snoke homeland ... I suddenly had a weird thought of it being her who puts Rey on Jakku ... almost like if she could save one kid before going to her death ... I have no support at all for that notion of course except that she is an extremely pragmatic character ... though it is interesting that they are both called "Ray". Now I know that Rey maybe got her name from the rebel pilot helmet ... but that's three "Rays". I don't know what it means, but it's interesting. Oh and also on Rey, did you see that worry Rax had about "even the most rotten fruit leaving behind seeds". That felt like that could be a hint about Rey. @SoloSideCousin you can message me if you have any questions. I haven't finished the book yet, but I did grab a lot of information on the Internet here and there and I might help you. I'll try the best I can! Didn't Pablo say recently that the Rebel Pilot helmet Rey has doesn't have her name on it? I thought it was the initials of someone's kids who worked on TFA and people had been interpreting the letters wrong. Her name is and was Rey as far as that goes. I don't think they would change it now it's been established. Maybe it might end up being short for something but it would be an unusual move in a film such as this where kids know her as Rey to have her name turn out to be something altogether different like Kira or one of the other pre-production names. i wonder if they changed it because it was too similar to 'Kylo'? I don't follow Pablo so I don't know what he said. Unless someone brought it over here I wouldn't know. I just remembered something about Dosmit Reigh and the helmet and found it interesting that we have three characters in the new universe named some version of "Ray". It probably means nothing, but I just wonder why they decided give two prominent characters homonym names when they could have chosen any name for Rae Sloane. She doesn't need all those "ray of light" or monarch type attributes that are fun to speculate about with Rey. Oh wow! So then there is actually a fourth too. That angry goddess that destroyed Jakku is particularly interesting ... especially since I have a feeling that jakku's internal orange and blue energy might connect to Rey in some fundamental way. In legends, Palpatine exploded in a Dark Side Burst, releasing a large amount of energy and causing shockwaves in the force (in Palpatine's case it was blue, in the case of Darth Nihilus, it was red)....I wonder if the orange was the planet's natural force energy and the blue wisps were the last of a previous dark side burst. Another thing that is really interesting in the book is that the core of the planet turned red and the blue mist turning black, following which Sloane sealed the core to save the planet....it reminded me of how kybers are bled and turned red....even if the planet was saved the core remained dark.....and then there is the quote- All fruit, no matter how rotten, can leave behind seeds. I feel it either points to !darkrey or rotten parents. I was just going by this PH tweet https://twitter.com/pablohidalgo/status/822111810945884160 The lettering was originally R & H and he came up with an in-universe thing for the Visual Dictionary. I'm not saying there's no connection between all these various iterations of the name Rey but I don't think we are meant to take it that Rey got her name from that helmet. How the heck did you people read the book already? Did you skip sleeping? My Kindle says I read only 20%. But yeah, work is crazy so no way I can do a reading marathon. I read the last pages though, as I always do. Baby Ben in Han's arms is so... Mean author playing with our feelings. - I am laughing so hard at the name Niima Outpost now because I picture this thin worm-like female version of Jabba thinking she's a Goddess. - Niima and her slaves on Jakku remind me of Immortan Joe and his war boys. - Just when you think Rae Sloane is not that mean, she shoots a guy in the head - he did not exactly have a future but still... Love her nonetheless. - Lots of fanatism everywhere. I must say LF is not afraid to go into gritty territories. I am quite impressed. @SanghaRen wrote: How the heck did you people read the book already? Did you skip sleeping? My Kindle says I read only 20%. But yeah, work is crazy so no way I can do a reading marathon. I read the last pages though, as I always do. Baby Ben in Han's arms is so... Mean author playing with our feelings. Lol.....I thought the same thing- Niima and her slaves sound like Immortan Joe and his gang....actually the place where she resides also sounds like something out of Mad Max's world. Yup! I'm a little farther than you are--35% of the way though, and I agree with all of this. I know that I'd heard the name Niima the Hutt before, but I'd never made the connection with Niima Outpost in TFA. Rae Sloane is such a great character. I'm not normally a huge fan of doing all sorts of cross-overs, but I really would love to see her brought into the movies in some way. I remember when Life Debt came out, it seemed like some folks had it done in under two days. I simply cannot read that fast and follow the story. I like to take my time, take it all in and savor it. So it's not just you. I just picked up my copy about an hour ago, and have finished to prelude. I can't wait - this is gonna be great! Well, I'm still waiting for my copy to arrive, and I'll be lucky if I get it next week. @Darth Dingbat wrote: Well, I'm still waiting for my copy to arrive, and I'll be lucky if I get it next week. According to Amazon: my item has been dispatched yesteray. That means week or so of waiting for me. Don't worry we'll get to see TLJ before everybody I guess.